The Best Steak Dinner | One Picture, A Million Words. I rarely cook meat and when I do, I try to source out recipes that appeal to my family’s fairly conservative tastebuds because, hey, I want my boys to enjoy their once in a blue moon meat fix! It is my sort of apology for putting them through the vegetarian dinners all week long. When I saw this recipe by Jenny Rosenstrach for marinated flank steak in this month’s issue of Bon Appetit magazine, I knew immediately that I had to try it. From soy sauce, scallions, garlic, brown sugar, sesame oil to lime juice, it had all the ingredients we like and use regularly in our kitchen so what is there not to like? And the steak was indeed so delicious we had to fight each other for the remaining slices on the plate – we train our kids from young to learn that their parents keep good things to themselves around here ;) Okay, maybe not all the time but it certainly was the case when it came to this steak. 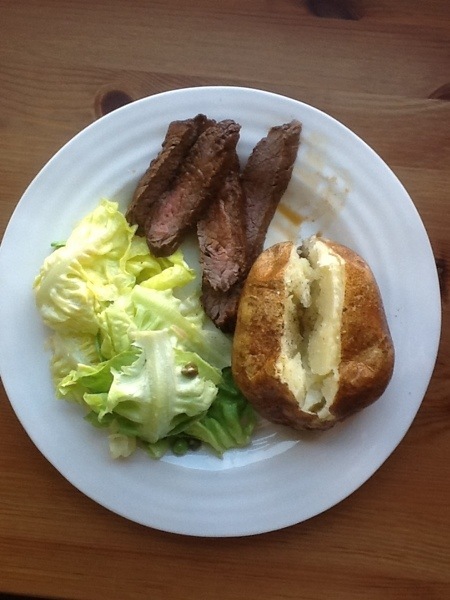 One thing I learnt from this meal: my son is a carnivore. My firstborn daughter hated meat so much that my baby son’s carnivorism comes as a shock to me. I have completely forgotten that regular kids like to eat things like chicken nuggets and drumsticks, ham sandwiches and hamburgers, fish sticks and meatballs – there’s a reason why these things are always featured on kids’ menus! I served baked potatoes and a green salad dressed with a lemon caper vinaigrette with the steak, which was truly the star of the meal.